I love the mix of sounds on this. 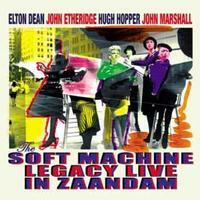 It’s got plenty of jazz and fusion, but you have to figure that since it’s Soft Machine Legacy. There’s space rock, too, though. There’s also a lot of groove to it. It’s a great album that works quite well. This is really entertaining stuff. A space rock meets jazz vibe opens this. The cut builds out from there into a killer fusion groove. The music here does a great job of mixing rock and jazz in motif that moves between more atmospheric sections and more groove oriented. It soars and it also dances, sometimes doing both at once. There are some truly awesome musical passages in this as it works through all kinds of changes and variants. It’s quite an intriguing musical adventure, really. This one starts off mellower and more tentatively. It builds out in little bursts of sound. After the thirty second mark a groove starts to emerge, but it never really takes hold then. They have some more sparse wandering before a full on jam does eventually take it. This rises out then in some serious fusion excitement. Various instruments lead the way as they work through several changes and alterations. This is a living, breathing, evolving beast. At various times it takes on different forms and colors. I really love some of the guitar soloing later in the number. In fact, this extensive jam might be my favorite thing on the whole album. Here we get a cut that’s much more in the melodic jazz vein than the pieces that preceded it. This is another cut that has some killer guitar soloing. In the same, melodic jazz, territory as the previous cut, I really love some of the bass work on this. The horn playing really creates most of the melody, though. The guitar drives it at points later, though. All in all, this is a fairly “straight line” piece with all the evolution happening very gradually. It’s also one of my favorites here. Drums start this and hold it for a short time. Then guitar just screams over the top in some smoking hot fusion soloing. Of course, the drums keep right up, pounding around on their own. It gets kind of crazed at points with some weird rubbery note bending later. This is the shortest piece on the album, weighing in at less than three minutes. A killer groove opens this and they work out from there in fine fusion fashion. It builds out to a great jam as it continues. There are some moments where it feels close to King Crimson, but there are plenty of other musical references that land it more purely in jazz, too. This is another number where the bass line sometimes steps forward to meet you. This is a great piece of music that presents some awesome sounds.